Is there a difference between a sponsor and an underwriter? It seems that definitions from various fund raising sites suggest auction underwriters and auction sponsors are the same thing. It’s a matter of preference as to what you wish to call it. But I’m going to go against conventional benefit auction wisdom (imagine that…) to argue that I think they should be different. An auction underwriter pays for the cost of a product or service in the benefit auction. If the band charged $10,000, the underwriter of the band pays $10,000. If the printed materials cost $7042, the underwriter of the printing pays $7042. The underwriter doesn’t pay substantially more (or less) than the cost of the service or product they are underwriting and receives unique benefits related to that item. An auction sponsor is buying into a package. The package isn’t tied to a specific cost of a product or service. Using my definitions, your group can market a well-developed slate of sponsorships with appropriate benefits ($1000, $5000, $10,000, etc), and also offer underwriting opportunities to companies and individuals that – because of their business or personal interests — would be keen to pay for a specific service or product. For instance, a bank works with money. It seems to be a natural business to approach when you seek an underwriter to cover the costs of new check-out software … or a check-out service. And a liquor store might be a logical underwriter of the bar. And companies or individuals without a natural tie to a product or service your organization needs to have underwritten can be approached to buy a sponsorship. This gives you a natural breakdown. As you generate a list of companies to approach, you can put them in the proper category and target them for future donations. Terrific distinctions – thanks, Sherry. Our school auction committee was chaired this year by a mom w/professional fundraisng experience that also understood this distinction – to the tune of $20K in increased revenues! Absolutely I think there is a difference. I’ll take a sponsor any day over an underwriter. While it certainly benefits the nonprofit with greater revenue, the sponsor can also enjoy packaged benefits designed to increase exposure and highlight its commitment to the communnity. I wouldn’t have known the difference, but I think you got it just right. 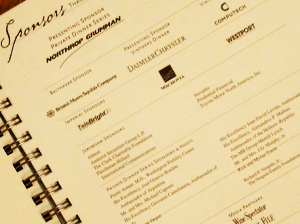 There is a place for sponsorship and underwriting at any fundraising event – not just auctions. The most important thing is to have sponsors and underwriters of your event and not just sell tickets. I love this distinction. And is has the added benefit of making it easier to add sponsors! Thank you so much for putting this in writing. I have been trying to get people to realize this difference for years. For some reason people think underwriting is for individuals/couples and sponsorships are for companies. Keep up the great work Sherry! Another definition of ‘underwriter’ is that of a company/individual that provides support at a fundamental level upon which the organization depends to fulfill its mandate. I worked for a large Telco and this company underwrote the mainstage performances of the local opera company; the opera company felt that the term ‘underwriter’ carried more prestige than sponsor.